Niroula's Tea Factory in Chota Poobong Darjeeling. DARJEELING, India -- The heavily potholed dirt road winds through pine forests, quiet hamlets and small tea gardens before bending off in front of the factory at Niroula's Tea Farm. Nearby, two workers pluck tender green tips -- just two-leaves-and-a-bud -- of tea, balancing wicker-baskets on their heads and themselves on the sloping ground. "Twenty years ago, we had potatoes growing here, and maize and other vegetables," said Bhawesh Niroula of Chota Poobong village, 8 km from Ghoom, India's highest railway station. "My father changed that." However, owing to personal hardships, Bikram Niroula had to stop growing tea in 2009. Five years later, Niroula's son Bhawesh, who was an electronic engineer with U.S. computer maker Dell in Bangalore, came home for good and restarted the business. He even went a step further, setting up a "mini factory," the first of its kind in the Darjeeling hills, to process the leaves from his 2.8-hectare garden and those of other small growers like him. "I wanted to end the dependence on big estates, who dealt with small growers like us rather arbitrarily, never adequately paying what was due for our green leaves," Niroula said. 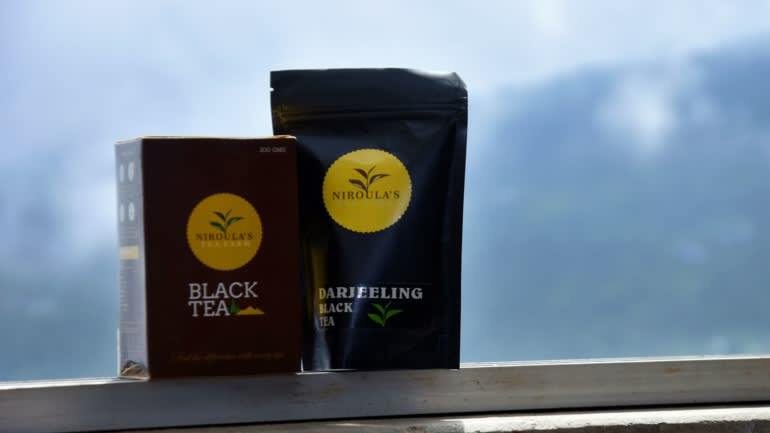 Niroula's Tea Farm now sells traditional black tea in India and abroad, including the U.S., Canada, France and Germany. Its Niroula's Pride won the gold medal at the 11th International Famous Tea Appraisal held in China in May 2016. Niroula's operation marks the coming of age of the small tea growers movement in the Darjeeling hills, where tea production is concentrated on 87 large estates. Estates, or plantations, typically grow tea on huge tracts of land and have an on-site factory for processing. The work is labor intensive -- every leaf is plucked by hand -- and the workers live on the estates. Their food, health care and children's education are provided by the management. A relic of the colonial past, these huge unwieldy plantations, despite the fact that many of them hold Fair Trade certification, are seen by some as enclaves of exploitation. A tea picker earns only 160 rupees ($2) a day and has no rights to the land she works. "Niroula's Tea Farm and processing unit is a pioneer and paradigm shift in what Darjeeling tea is ... and a look at what it could become," writes Geoffrey Norman in his blog, Steep Stories of the Lazy Literatus. Niroula's tea factory is the first owned by a local Nepali-speaker, or Gurkha. Darjeeling's tea industry has always been dominated by outsiders -- first the British, then Bengalis from eastern India and Marwaris from the west. Big conglomerates, mostly headquartered in Kolkata, pull the industry's strings. Gurkhas, mostly brought in by the British from Nepal over 150 years ago, were traditionally restricted to picking leaves and factory work. A small tea growers movement began in Darjeeling in the late 1990s. "My father was among the first batch of 20 or so people to start growing tea as small growers in 1999," said Niroula. In 2000, the Organic Ekta ("Unity") Small Growers' Society was formed with about 50 members, including Bikram Niroula. Today, there are about 800 small growers, many of them Organic Ekta members, registered with the Tea Board of India, which is promoting the sector's development. They either sell their crop to big estates or to smaller operations like Niroula's. "I source green leaves from about 190 small farmers. There's another mini factory in Mirik which has about 70 to 80 small growers supplying green leaves to it. Then, there are three very small home-run units making very good teas." "Bhawesh Niroula will be the real, real hero, the inspiration for next-gen self-respecting entrepreneurs of Darjeeling," said Rajah Banerjee, former owner of the Makaibari tea estate who was one of the early promoters of the small growers' movement. Niroula pays 60 to 70 rupees per kilogram of green leaf to the growers. "The big plantations pay them only about 50 to 55 rupees," he said. "To the workers who pluck leaves, we pay 300 rupees, which is almost twice what the big estates pay. Unlike the big plantations, Niroula does not have to shoulder the cost of housing workers or other benefits. The tea board defines anyone cultivating tea leaves on less than 10 hectares as a small grower, and any processor making less than 500 kg of tea a day as mini factory. When he first got started, Niroula had a problem at his factory: The heater meant to dry the leaves produced a lot of smoke, which affected the tea's flavor. It was unintentional, but tea connoisseurs around the world loved the smokiness. "The first flush was smoky, spicy and floral; whereas the second flush adhered to muscatel ... with smokiness. Like a vineyard on fire, while passers-by ate fragrant sweet bread," Norman writes, pleasantly surprised by the aroma of Niroula's teas. "As the word spread, more people sought it out," said Rajiv Lochan, a Siliguri-based exporter of Darjeeling tea. Today, Niroula deliberately oak-smokes some of its exclusive teas to impart them with a "gentle, smoky imprint." While most of the factory's teas are machine rolled, some are rolled by hand. Niroula's Farm teas sell for 2,500 to 3,500 rupees per kilogram. "We see a lot of interest among tea lovers concerned with ethical farming," Niroula said. He hopes to receive still higher prices if he can get his product certified as Darjeeling. In 1999, Darjeeling became a geographic indicator. But at present, only the tea produced on the 87 estates in the district can be called Darjeeling. Niroula has written to the tea board a number of times, but has not received a response. "This is strange," remarks his wife Sonia, who handles marketing for the family venture. "When we sell green leaves to the big gardens, they can process them and market them as Darjeeling. But when we do the same thing in our units, we don't get to use the Darjeeling logo. This defies all logic." The couple are currently busy planning a tea lounge in the town of Darjeeling, 16 km away. "It will be a place for connoisseurs to sample the finest teas made by small growers," Sonia says. Although Niroula is reluctant to disclose figures, he says: "We are doing well enough not to regret giving up our highflying lives in Bangalore." The heavily potholed dirt road winds through pine forests, quiet hamlets and small tea gardens before bending off in front of the factory at Niroula's Tea Farm. Bhawesh Niroula of Chota Poobong village, 8 km from Ghoom, India's highest railway station.